Taiwan is one of the world’s greatest destinations for hot springs. Jan. 14, 2015, 12:12 p.m.
One of the best ways to experience a raw and unfiltered destination is to take a stroll through its streets. Jan. 7, 2015, 12:08 p.m.
Divination blocks and ancient cultural practices. Dec. 31, 2014, 3:31 p.m. The Taiwanese calendar is lit up with festivals and national celebrations, and if you’re lucky enough to be in the right place at the right time, you’ll get to witness Taiwan burst into life in a way that truly connects everyone visiting and living on the island. The Matsu Pilgrimage in April is one of the biggest moments of the year. This highly popular march of millions takes place to celebrate Matsu’s birthday. Matsu is the Goddess of the Sea, and one of Taiwan’s most revered deities. A presence in just about every temple, Matsu is said to protect those embarking on an ocean voyage or braving waters of any kind. Over nine days, pilgrims from all over the world walk across the entire island through varied and difficult terrain while helping to carry a statue of Matsu, who’s seated on a sedan chair. The whole walk hovers somewhere around 300 kilometres in total. While you’re walking, it’s believed that the closer you can get to the sedan chair, the greater luck you’ll have in the coming year—especially if you can manage to reach out and touch it. Of course, this isn’t exactly an easy proposition when you’re jostling through a hot crowd of millions. As you might imagine, getting close to the chair can quickly become frenzied and frantic. In the depths of reverence, some worshippers even drop to their knees in the middle of the road and let Matsu graze over their bodies. The Matsu Pilgrimage inspires a wonderful sense of community across Taiwan. Pilgrims walk from town to town, and temples along the way will often provide a warm meal or simple accommodations. Local residents, shopkeepers, and businesses will open their doors to those in need of water or a rest. Along the way, you’ll be sure to run into elaborate performances and fireworks, all to keep the birthday girl happy. Ancient explorers knew Taiwan by the name Ilha Formosa—the beautiful island. Defined by its stunningly rugged mountains, its vast and verdant rolling plains, its endless coastal and cultural wonders, Taiwan is indeed a land that invigorates the senses, captivates imagination, challenges the body and beckons the traveller. Join Team Outpost as we embark on opXpeditions Taiwan—follow as we set off to cycle, trek and explore this fantastic island paradise from the vibrant and ultramodern capital city of Taipei, to long and scenic ocean-side routes that wind around the famous Cingshuei Cliffs as we head toward Taroko National Park, Hualien, Taitung, Ruishui, Dulan and Kenting. Team Outpost Taiwan will show you, by foot and by pedal, just how enticing this legendary island can be. Follow opXpeditions Taiwan as Team Outpost posts written daily dispatches, spectacular photography and video, for a perspective of Taiwan you won’t find anywhere else. 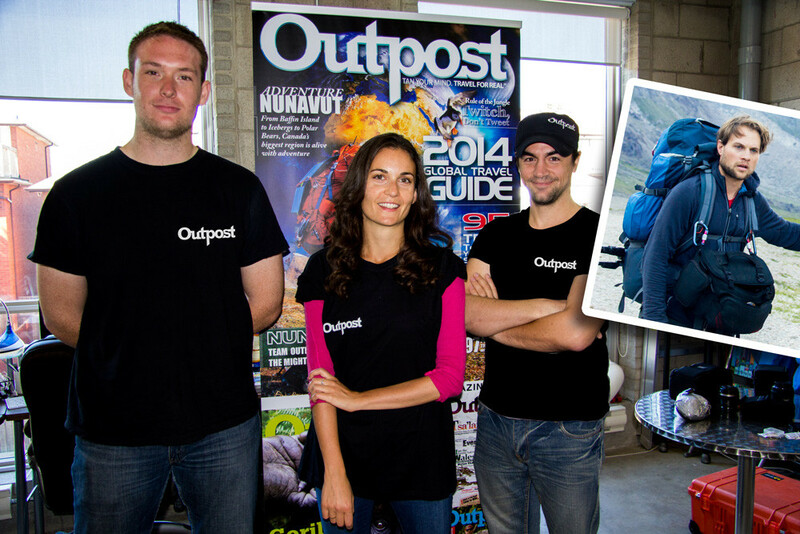 Team Outpost, from left to right: Daniel Puiatti, Associate/Online Editor; Sophie Kohn, Writer; David Spadavecchia, Creative Director; Will Allen, Videographer. Oct. 7, 2014, 10:40 a.m.
Taiwan is a geographically small island in southeast Asia that sits just off the southeastern coast of mainland China at 23.5000° N and 121.0000° E—the Philippines sit directly to its south, and Japan to the north-east. Taiwan's land territory stretches about 35,980km² making it the 38th largest island on earth and just slightly larger in area than Vancouver Island (31,285km²) in British Columbia, Canada. Taiwan's geography is defined by two contrasting regions: the rugged, forest-covered, and almost completely impenetrable mountains on the eastern two-thirds of the island, and the flat to gently rolling plains on the western portion of the island. Taiwan's climate, much like its geography, is divided into two distinct regions: the tropical monsoon climate that dominates the south, and the subtropical monsoon climate in the north. The temperature is mild in winter and hot in the summer. Temperatures rarely dip below 8 degrees Celsius from December to February, while from February to October temperatures tend to get much hotter, peaking in July around 37 degrees Celsius. One of the coolest festivals this side of the planet has to be Taiwan’s annual hot air balloon festival. A little freaky to view like but in a super cool way—every summer, the skies of Taitung County in eastern Taiwan are dotted with decorative hot air balloons that drift overhead like giant multi-coloured soap bubbles. Indeed, the Taiwan International Hot Air Balloon Fiesta is one of the longest in the world—this year (2014) it launched at the end of May, ended in mid-August, saw pilots from 12 countries and hundreds of thousands of tourists and spectators. The festival typically includes fantastic aerial shows (even more spectacular to see with the balloons so brilliantly decked out in ornamental detail), night-glow music concerts, summer ballooning camps (which tourists are encouraged to participate in), and perhaps coolest of all, balloon weddings! And yes, for a fee you can even hitch a ride for an unparalleled panoramic view of the stunning East Rift Valley and grasslands below. Next summer, 2015, the festival promises more pilots and balloons, more participant countries, more activities, and most importantly more spectators who partake. Just another great reason to visit Taiwan. Oct. 7, 2014, 10:31 a.m. In homage to its burgeoning reputation as a cycling mecca, there are now at least 26 major bikeways through the 12 “national scenic areas” on the island’s four quadrants. Indeed, over the last ten years alone approximately 4,800 km of bikeway has been laid and built across Taiwan, representing hundreds of well-placed, well-marked, stunningly scenic routes, many of which include cycling maps and rest stops along the way. Our opXpedition across Taiwan will include some of this spectacular road cycling—and we’re both pushing and pacing ourselves: pondering whether we might accomplish 80 to 100 km a day, though much of what we can do will depend on weather, terrain (Taiwan is notoriously hilly, and vertically sliced by the Central Mountain Range), and other non-Team-Outpost-controllable factors. Controllable factors are how ready we are for some multi-day, long-distance, possible uphill pedalling! For cyclists who want a challenge Taiwan is super optimal, boasting a fantastic combination of terrain, tropical forests, lush rice and tea plantations, ravines, spectacular coastal scenery, and often traffic-sparse roadways or vehicle-prohibited pathways, which together create superb long-distance cycling routes. Combine that with the island’s homegrown and home-based bike brands and renters and you’re off to the races. The top-to-tip southbound coastal ride along the ultramodern Highway 11 that wraps the eastern coast of the entire island—or the more inland Highway 9 that follows a similar direction—will likely be Team Outpost’s preferred route. Stay tuned to see where we end up, and how we do! For serious cycling contenders there’s the Provincial Highway 18 Competition Route, and since 2011 the now annual and highly anticipated Taiwan Cycling Festival that is held every November in various venues across the island. Targeting all levels for participation—professional and amateur riders alike—the festival is fast becoming the highlight on Taiwan’s social calendar. Running a variety of smaller accessible races, bike tours and family-friendly activities, the festival also boasts two key competitive events: the Formosa 900 (an eight-day, 900-plus km, round-the-island relay race); and the uber-demanding Taiwan King of the Mountain Challenge (or KOM, where cyclists bike uphill for 100 km though spectacular Taroko Gorge National Park, gaining a gruelling 11,000 feet in elevation along route). So, if you’re ever in Taipei or another Taiwanese city, find yourself a tourist/visitor-centre kiosk, which typically has free cycling maps, and a host of other country biking info and get ready to explore this beautiful island via pedal power! Sept. 16, 2014, 4:48 p.m.